This post is the only way i could figure out how to get an image to upload. Generally you want those rear channel speakers closer to the rear center than the sides like that, I doubt you will gain much from those locations. 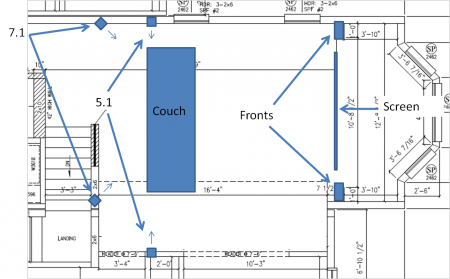 I would suggest a 6.1 ssytem with the rear speaker mounted on the stair wall as close to the center of the room as possible or just forget 7/6 channels and stay with a 5 speaker system. I went from 6.1 to 5.1 and I am not missing that rear channel in the least. I think this should do the tirck. There is a stair railing between the right rear speaker and the counch, but it shouldn't inhibit the sound too much.